The Explore play system Dixo can accommodate lots of children with all its different activities. The Dixo play environment stands out because it has two slides, which set the stage for competition. Who’s going to get to the bottom first? In fact, slides are not just fun, they also promote child development. When children go on the slide, they train both their gross motor skills and their balance. At the same time, they learn about gravity and judging distance and speed. Thanks to its size and design, Dixo can accommodate many children and a wide age group. 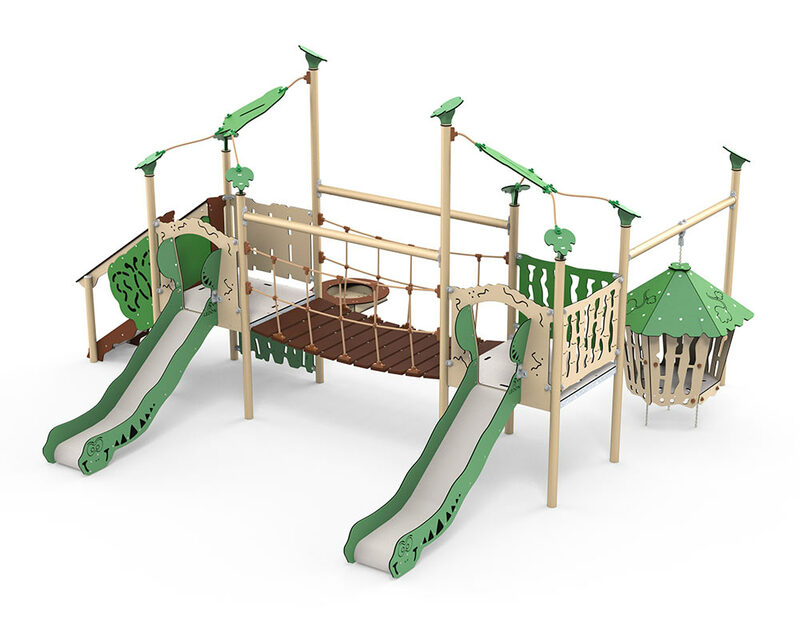 In addition to the towers with the two slides, the Dixo play environment also has a swinging jungle hut, which is a favourite hiding place for hide-and-seek and spending time together. There is also the splash table, where children can immerse themselves in water and play. The splash table incorporates a plug and overflow edge so it’s easy to clean.